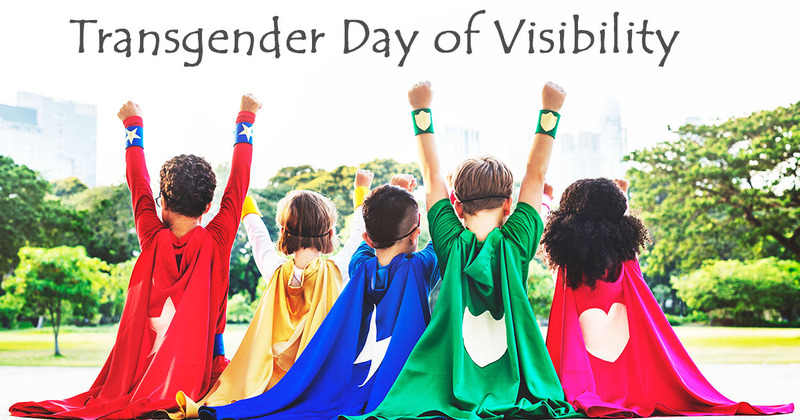 To the transgender community there are two important international days of recognition. The first, Transgender Day of Remembrance (TDOR) on November 20, is a day to remember and mourn the violence experienced by the transgender community. The second, the Transgender Day of Visibility (TDOV), today on March 31, is all about making the trans community more visible in society. 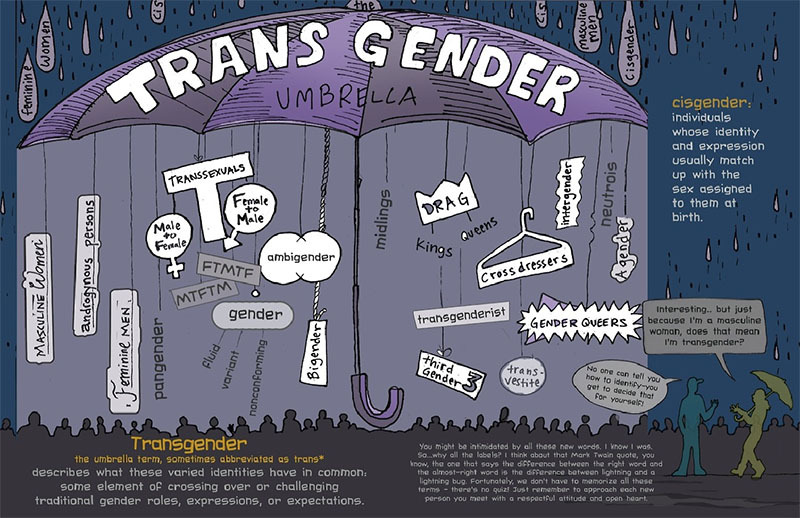 Transgender is a huge umbrella term to a lot of different people. For a long time, I considered transgender (trans) and non-binary (enby) as two very different identities. Now, however, my opinions on that have been changing. There is more diversity to trans identities than I used to think. The following thoughts are my experience, and don’t represent the opinion of every member of the trans community, of course. 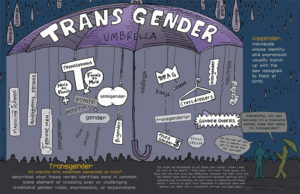 The Transgender Umbrella and questions on how non-cis identities interrelate have been discussed for many years. One such example is from The Gender Book (Marshall House Press, 2013) where it suggests incorporating non-binary identities such as agender or neutrois, plus other identities, into trans identities. Of course, every enby person decides whether they identify as trans or not for themselves. Discussing the Transgender Umbrella can go on for days and days—all I’d like to say is I’ve started to realise that, if cis means identifying with the gender you were assigned with at birth, and trans is anything beyond that, then enby really does slot into it. What does cis gender and transgender mean to me? For a long time, I didn’t consider myself to be trans. I identified, and still do, as genderqueer and, even more strongly, as enby. Although I didn’t know the terms cis/trans when I was younger, in retrospect I can say that I was never cis. But then why did I—and sometimes still do—have such a hard time with the word trans? To me, not only cis, but also trans, was just another binary system like man and woman. So since I didn’t identify as either a man or woman, I didn’t want to have any part of identifying as cis or trans either. If a person is trans, I thought they needed to know to which gender they were moving to, like it was a journey. There needs to be a destination, right? So when you’re assigned female at birth like me, being trans would mean you are a trans man, wouldn’t it? You were wrongly assigned female, then you corrected this mistake by telling the world that you are, and always have been, a man. At least this is what I thought. Over time, I realized trans was not as binary as I thought. Even if someone identifies as, say, a trans man, that doesn’t necessarily mean they see themselves as “all” male. Some do, but also, a lot of trans people just try to work within the categories society gives us as well as possible, which is male and female. All of these thoughts I had on trans and enby a while ago meant that I really needed to try and change some things to make myself feel better. In my private life, I changed my name to one that fit me better and I asked friends and family not to use a binary pronoun like “he” or “she” when referring to me. In English, my pronouns are “they” and “them”. In German, my native language, I prefer to be referred to by my first name (or a non-binary pronoun, but this is quite complicated in German). While I can’t smash the gender binary directly, and once and for all, I’m simply trying make this dreadful binary reality we live in less painful; for myself, and for every other person who hurts when being referred to by the name and pronouns they were wrongly assigned at birth. When it comes to visibility of trans and enby people, I feel two important things need to be remembered: Transgender people are, and always have been, all around us, and “trans” and “cis”, just like the identities “man” and “woman”, are not the binary concept people believe them to be. To me, cis people simply aren’t hurt when categorized as the gender they were assigned at birth. To me, trans doesn’t always need a destination such as “woman” or “man”. Sometimes, a person’s transition is from their assigned gender, to something different. To me, trans means: I don’t identify with the gender I was assigned with at birth. And mostly, I don’t really know what to do with that but, hey, we can all try to make our lives better by making things hurt a little less, genderwise. Sam is Queer Pack’s Crossmedia Expert. They identify as non-binary trans, a feminist, a TV junkie, a spoonie, and a chocoholic.